Last month, Colleen painted a bucolic picture of life with chickens that had me seriously considering adding a few to my backyard barnyard. Then I remembered why I have ducks. For me, the absolute number one selling feature of ducks is that they adore slugs and snails. Now, when I find a slug in my garden (which is rarer all the time), instead of swearing under my breath, I call my ducks, and watch them flap over to enjoy their favourite treat. My Muscovies also eat mosquitoes and wasps out of the air. They are fantastic garden companions—I wouldn’t let them in when I have young lettuces or strawberries but at the right time they do a very efficient job of cleaning up. They eat almost any pest, and don’t scratch, so they generally don’t disturb garden plants, and are actually quite gentle. One result of their voracious appetite for garden pests is that they forage a fair portion of their diets, which keeps down the feed bill. And unlike chickens, their manure doesn’t need to ‘rest’ before you apply it to the garden. While duck eggs may not be to everyone’s taste, to me they’re just more of the best parts of an egg. They’re bigger and richer than chicken eggs, with a higher proportion of yolk per egg. Ounce per ounce, they have twice as much iron (and twice the fat and higher cholesterol). They bake up especially light and airy and are coveted by bakers as a result. And they stay fresh longer because of their thicker shells. Unlike chickens, most duck breeds don’t stop laying in the winter, and they’re productive for a longer period of their lifespan. 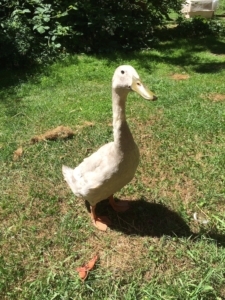 Ducks are often recommended as good ‘starter poultry’ because they are quite easy to care for. They are less susceptible to disease than chickens, and usually recover on their own if they do get sick. They are more cold, wet, and heat tolerant, and need less daylight. While some duck breeds need ample water, my ‘Scovies and Runner are perfectly happy with a 6.5-gallon tub. Ducks have no pecking order and are quite social and friendly both with each other and with people. Unlike geese, they aren’t aggressive even though some breeds, like my Indian Runner drake, are frankly “all bark and no bite”, chasing me away from his hens. He has no claws to speak of, and his beak is round, so flapping and quacking at me is the worst he can muster. Ducks are much less noisy than chickens, and drakes have no dawn crow to wake the neighbours. Their quietness can actually be a problem if you have a prowling racoon—I’ve found having a chatty drake gives me a lot more clues as to the general happiness of the flock than when I had only hens. A final selling feature is that, to me, ducks are just so pretty. They really do move ‘all in a row’ and I love watching their parade around the yard. They manage to pull off noble and cute in one waddle. Also, did I mention they eat slugs? In February, Program Coordinator Emma Luna Davis gave a presentation at Salt Spring Island’s Seedy Saturday about the Galiano Community Food Program’s Gleaning Project. Here are the notes from that presentation. Started in 2009, with support from the YMCA and the federal government. Galiano has many productive gardens and hundreds of fruit trees, many of which are heritage varieties that aren’t commercially available. And while many of our landowners do make amazing use of what they produce, there is waste. Sometimes it is because the landowners may have gotten older and find climbing a ladder difficult. In other cases, the property is owned by weekenders and it can be challenging for them to make use of everything when they are only onsite for a short time, and the window of time when things are ready for picking is not very big. Sometimes, we just have a bumper season, and all of a sudden people find themselves with more than they can use. At the same time, we have many low-income households without great access to fresh produce, which can be very expensive to bring in from off-island. We wanted to find a way to get this excess into the hands of people who need and want it, and cut down on food waste. This would be a way to reduce our dependency on produce grown off-island, and replace it with free, mostly-organic, local fruit. The project has been a great success. The impact has been a unique opportunity to bring the community together, get to know one another, and build a sense of shared bounty and appreciation for what our island has to offer. During the harvest season, we invite landowners who have a surplus to contact us. 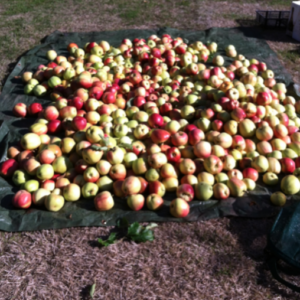 We then organize a group of volunteer pickers to meet at the property and pick. We then divide the produce into shares: 1 for the pickers, divided amongst the number of pickers we have, 1 for the landowner, and 1 that goes to the Food Program to be used in workshops or distributed to families in need. Often the landowner will decline their share or will only want a very small amount. In 2014, we picked an incredible volume and variety of apples, pears, figs, plums, quince, corn, grapes, crabapples, and hazelnuts. We held 18 picking sessions at 10 properties, and 45 volunteers came out to pick, ranging in age from 3 months to over 70 years. Our volunteers range from families who appreciate having access to free produce and the fun activity to do with their kids, to professional canners who access rare varieties to include in their products, to folks who use the produce to put up a big batch of preserves for the winter months, to people who just enjoy getting outside and picking as a group. We maintain a mailing list of interested volunteers, and we send them all an invitation to pick each time there is an opportunity. Typically when we send a callout, we indicate the maximum number of people we can accommodate based on the size of the harvest and the specific situation of the site, and then we confirm with a shortlist of people who have gotten back to us. We usually don’t have to turn anyone away, but if we do they get first dibs the next time they respond. We promote the program at our community events such as Canada Day and our annual Fiesta, with posters that we put up around the island, and through our email list. The Bellhouse, an old inn and farm, with a very well-established orchard of a variety of apples and pears. The current owner is mostly only a weekend visitor and enjoys the orchard but can’t begin to use all that comes out of it. We picked there 6 times last year. Cable Bay Farm, which grows the best corn in the Gulf Islands. The farmers, Thomas and Henny, are very picky about what they bring to market, so once the corn is past it’s prime, or if it’s a bit too small, they invite us to pick what’s left, which is still of fantastic quality. Page Drive, our senior living community, has one resident with an amazing huge prolific fig tree. She is no longer able to climb a ladder, so we pick her tree clean and it’s a win-win for everyone. The shares of our bounty that are earmarked for households in need are distributed in several ways. Galiano has a small food bank operated through our church, and we bring them a portion of what we pick to give out to their users. However, our food bank is closed for July, August and September, which is the height of our program, so we usually need to use other avenues. A new idea we’ve just begun is just keeping a bowl of whatever we have fresh on the counter at the clinic for people to help themselves from, along with some information about the program and how people can get involved. It’s challenging when we end up with unwanted excess beyond what we have the means to distribute. We’ve found it’s important to clarify how much our pickers are interested in taking home before we pick, so that we don’t pick too much. Sometimes we have a large volume we are saving for an event and so pest-proof storage is also an issue. This year we upcycled a broken refrigerator into temporary outdoor storage by installing a few air vents. We have to be careful stewards of the relationships with our landowners. We work hard to respect the property, only pick what we’ve been invited to pick, clean up any damaged produce, try not to leave any shares where it might attract pests, etc. and we always have one of our staff present for all picking sessions. This year we distributed seasonal gifts to our landowners of preserves that had been made by our volunteers. In the past we have had incidents where people have approached landowners to ask permission to pick before our harvesting sessions, so we no longer share the exact location of each picking very widely, only to the shortlist of volunteers who are confirmed to come out. Right now things are working well. If we had more resources we might consider bringing our volunteers together to tackle two other considerations: thinning and pruning in the off season, in order to improve our harvests and the health of the trees we pick.